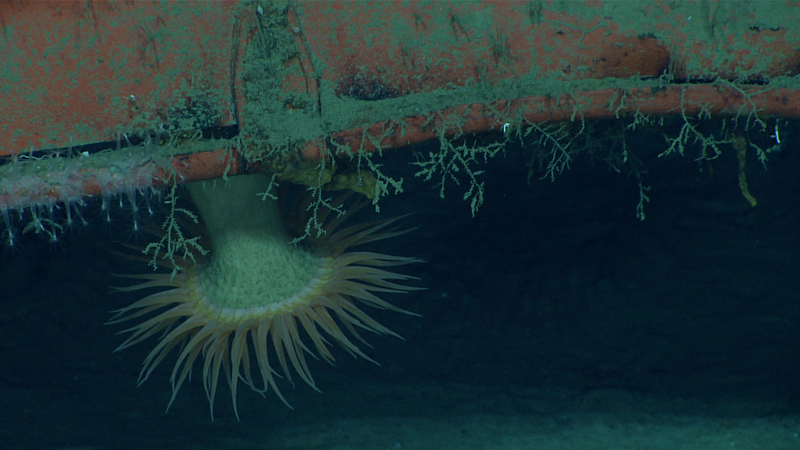 A hormathiid anemone and hydroids on the underside of the shipping container. Image courtesy of the NOAA Office of Ocean Exploration and Research, Gulf of Mexico 2017. Download larger version (jpg, 787 KB). The mucous (protein and cellulose) house of a larvacean, a planktonic relative of sea squirts. Although the tadpole-shaped architect that normally resides within may have evacuated (as is normal after a time), the pale central inner filters that it constructs remain visible. The meshes of these filters are so fine that they trap bacteria-sized and smaller particles. Image courtesy of the NOAA Office of Ocean Exploration and Research, Gulf of Mexico 2017. Download larger version (jpg, 1.1 MB). A colonial tuscarorid phaeodarean, a relative of radiolarians and foraminiferans, feeding on a filament of marine snow. The individual cells of the colony each secrete a white silica shell, or test, with several fine radiating spines, and together they create the pale sphere composed of fine silica mesh. Seen at a depth of 701 meters (2,300 feet). Image courtesy of the NOAA Office of Ocean Exploration and Research, Gulf of Mexico 2017. Download larger version (jpg, 547 KB). During Dive 12, we set out to explore a side scan sonar target thought to represent an archaeological site and related debris; however, the target instead ended up being a 40-foot shipping container and its contents. While not the shipwreck we were expecting, the dive provided valuable information. Identification markings found on the container may help to track it, which could provide a maximum date as to when observed animals colonized these structures, allowing us to estimate growth rates of sessile organisms. The dive also served as a reminder that, even in the deep ocean, humans can have an impact. Video courtesy of the NOAA Office of Ocean Exploration and Research, Gulf of Mexico 2017. Download larger version (mp4, 83.5 MB). The original purpose of today’s dive was to conduct the first visual survey of a side scan sonar target thought to represent an archaeological site and related debris. However, instead of a shipwreck, we discovered a 40-foot freight-shipping container and its cargo of washing machines, dryers, chest freezers, dishwashers, and refrigerators. After locating identifying markers that may help to track the container, we spent some time documenting the biology on the container and associated debris, observing hydroids and stoloniferan octocorals, as well as a number of fish sheltering in and under the container. We also observed a bamboo coral (Isididae sp.) growing on a washing machine. We made the decision to end the benthic portion of the dive early to conduct transects in the midwater at eight depths from 1,000 meters (3,280 feet) to 300 meters (984 feet), in 100-meter increments. An excellent diversity of midwater animals at temperatures ranging from approximately 4°C (39.2°F) at 1,000 meters to over 13°C (55.4°F) at 300 meters characterized the water column. Animals encountered included ctenophores, siphonophores, medusae, fishes, and shrimp, as well as single-celled and colonial protists. 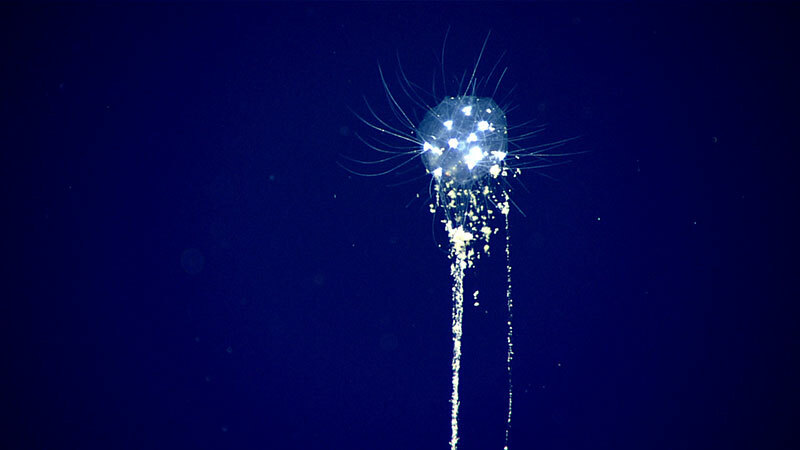 A physonect siphonophore, possibly Apolemia sp., had tentacles emerging from between its nectophores. Several halicreatid medusae were observed along with narcomedusae in the genus Solmissus. 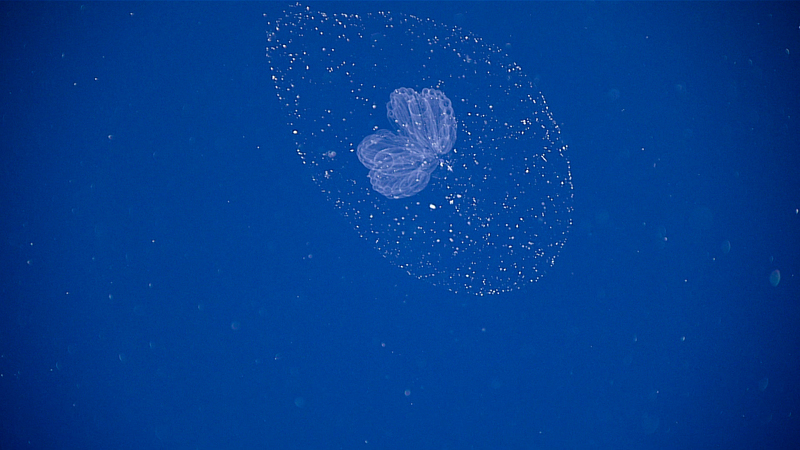 A ctenophore in the genus Kiyohimea was found at the end of the 300-meter transect in perhaps the warmest water (over 13.8°C) recorded for this genus. Considering the volume explored and the number of encounters, this midwater environment seemed to be densely populated with a substantial diversity of organisms.